Seabreeze Studio apartment is on the ground floor, very large and well equipped with a state of the art bathroom and small kitchen. It has its own entrance and terrace and, should you have a car, parking. The apartment has full central heating for the cooler days and a flame effect stove which gives the apartment a cosy feel in the winter. Fluffy bathrobes to lounge about in and candles too! 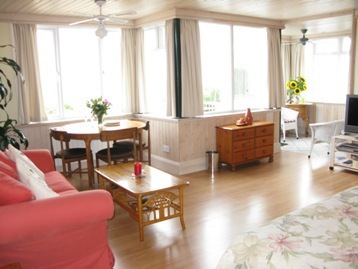 There is a small fully equipped kitchen, full size cooker, microwave, toaster, coffee machine, dishwasher, washing machine and tumble dryer. 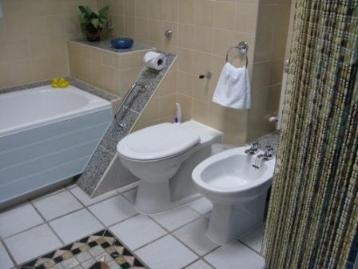 The well-equipped bathroom has a full sized bath with separate power shower, a bidet and basin. 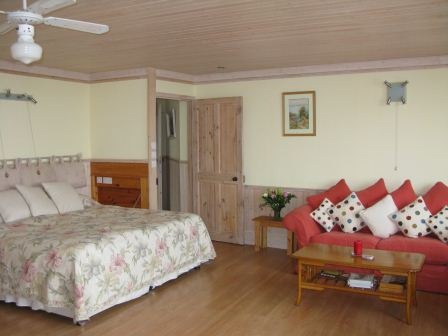 A hairdryer, bathrobes and plenty of large towels are also supplied. Maggie and Francis take great pride in their home and garden it has been in the family forever!